This is a place where I let you know where I’ve been and which places are on my wish list! I also want to know where you’d like to go. Let me know which wonderful places are on your wish list and I’ll do my best to get there too and show you how fabulous it is – spurring you on to actually go there yourself! Living on the NSW north coast, we are so blessed to have so many beautiful places just a stone’s throw from home. Here are some of the fabulous places we’ve loved so far this year! Travel is always made easy with the amazing Volvo "XC90 All New Beginning" giving us comfort and safety all the way. 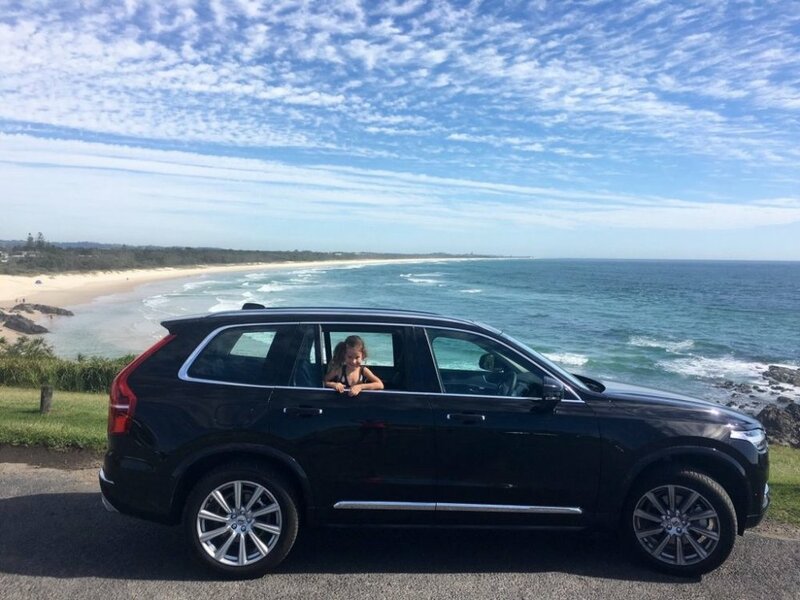 Having reliable transport is just the best peace of mind and the XC90 is cream of the crop! One of the many features I love about the XC90 is the Lane Aid. This fabulous mechanism alerts me if I get distracted with the kids; whether they are arguing or simply being noisy! The lane aid works by gently moving the steering wheel back to steering straight again. If your car is about to cross a lane marking without the car's indicator being activated, the system helps you keep the car in its lane, by steering it back. Also, if you drive into another lane, you’ll be warned by vibrations in the steering wheel or by a warning signal. The XC90 is safety at its best! Life is always better at the beach! I truly believe being on the beach is the best escape anybody can have – the perfect place to unwind, as well as get some fun, light exercise. You can either splash about in the waves or run along the sand, with or without the kids! Noosa has it all – divine beaches as well as fabulous shops, cafes and restaurants. This place is truly divine – there’s something so magical about being in a rainforest. The kids and I even took time for a quick meditation session to recharge our minds during our 3 minute meditation challenge last month! Tap picture to press play. Protesters Falls is part of the NSW National Parks, with a superb world heritage rainforest. We loved exploring the walking tracks that led to the incredible water falls. The health benefits of being outdoors are countless – you will get a burst of happiness that’s guaranteed to improve your outlook on life. A study at Japan’s Nippon Medical School found women who spent six hours in the woods over the course of two days had an increase in virus and tumour-fighting white blood cells, and the boost lasted at least seven days afterwards. Being ‘at one’ with nature also gives your brain a break from over-stimulation and lets you relax. It's like my family was meant to be together.....@NOMADZ6. A nomad is a wanderer, a member of a people that travels from place to place to find fresh pasture for its animals and has no permanent home. Who would've guessed it? That's why I have created Wanderlust on Wednesdays. What about you? Where do you want to go? Transformation Tuesday with Daniele Driusso!